you guys seem to have gotten this right save for tier 9.in order to be tier 9 you have to spend a boatload of cash and the reward is 100 angel keepsakes and 200 angel rune books.anyone that has spent this amount of cash has thousands of angel keepsakes and hundreds of angel rune books clogging up their inventory already(meaning they dont need them at all). 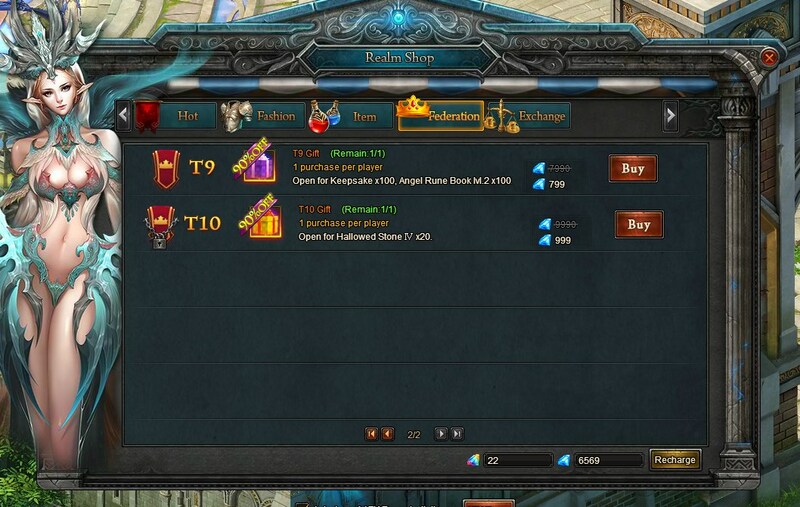 if youve had even 1 t9 player buy the keepsakes/books from federation shop then you can ignore this post,but im taking an educated guess and saying not a single person has bought this. I\'ll be honest I did need a few extra keepsakes to light a heart on my angel at one point and bought this for the keepsakes alone since 799 was less than the cost of buying the keepsakes in shop (100*30=3000) but yeah the discount was nothing like as much as it said really since the books just added to a stack of unused books and got synthed to level 3\'s to compress the space they were using lol. I guess the books might come in use when they unlock the level 5 angel rune skills though assuming they make level 5 books available for synth since they would require a lot of level 2 books to synth even one. 5^(5-2)=125. damn you for being honest lol.id still rather dragon bones or lev 5/6 talent books........but i suppose 1 day i will need some extra keepsakes/books. well this isnt the first time ive admitted to being wrong,today i decided to solely focus on angel promotion and raising the levels of both my angel skills and damned if my stacks of rune books didnt disappear in around 10 mins. keep t9 shop just the way it is. 2019-4-22 16:55 GMT+8 , Processed in 0.125732 second(s), 42 queries .